While I was in Salt Lake City, I truly appreciated all the great indoor activities there are for children. One night I met up with Joyelle and her two boys, Mr. A and Mr. X so we could catch up on old times (she is my ex-husband’s little sister, and therefore I have known her since she was a pre-teen). 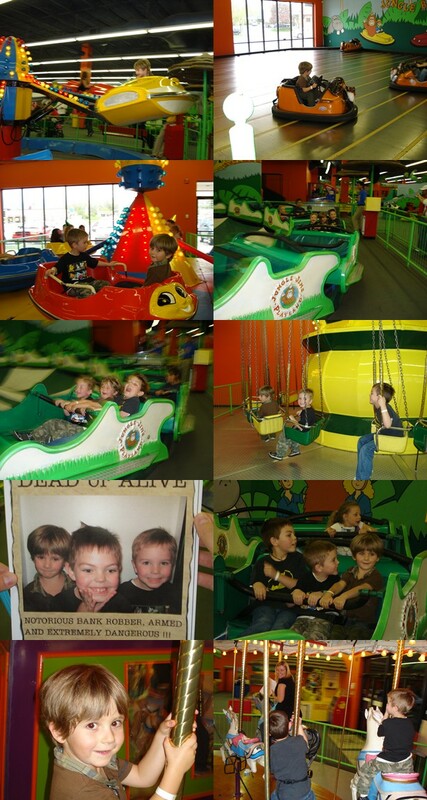 We went to Jungle Jim’s Playland for rides and games. Joy and I got together for fun a few more times, once to go up to Layton to see my littlest ex-sister-in-law Sunshine (now a mom of three adorable girls and a tall boy!). Another day we went to Ikea, where the boys played in Smaland. The Boogedy wasn’t potty trained last time we went, so this was his first visit to the fun part of Ikea. The weather was rainy and cold, and Mr. A said “Sara, why do you always have on the same clothes? !” I replied that I was only expecting to be in town for 12 days, but now I would be there for a month and I only brought one pair of warm pants and one jacket, which got worn almost every day. Who expected bitter cold and rain in May? I should have. I used to live there, I know better. All my skirts and shorts sat unused in my suitcase for almost the whole stay. Jungle Jim’s was a really easy place to entertain my kid, so we went back once more with my nephew Jake. Here he is, facing a desperate losing battle against the Boogedy.